Hemp-Based Vanilla Mud Mask | Acne masks for sensitive skin all smelled like medicine. I was over it. This is a deeply hydrating clay mask that smells like Vanilla. Real Vanilla, not fragrance or sicky sweet perfume. The combination of pink clay + cream clay detox while Hyaluronic Acid hydrates! Fermented Cherry + Lemon brighten complexion while Butterfly Pea is packed with Antioxidants! Smells of Lemon + Vanilla & is a pinky-rose color! I love vanilla, maybe a little too much (if that is even possible!) I crafted a truly pure mud mask using extra fine Cream Kaolin Clay to purify and Vanilla to soothe and transport your skin to a softer state. Helps detox pores + balance oil production + calm the senses. This mask is super gentle, smells amazing, and leaves skin soft + glowing. Gently detoxes without stripping while a blend of three sizes of Hyaluronic Acid hydrates + plumps the appearance of skin + helps skin retain moisture longer over time. If your skin is feeling red + itchy + dry + tight + or just bleh, this is the perfect mask for you. I like this for literally all skin types, because the gentle rejuvenation and hydration benefits all skin concerns and types. It won't dry you out but leaves skin plump and hydrated. Safe for all skin types and ideal for anyone who hates tight drying masks. Gentle White Kaolin Clay and a touch of Australian Rose Clay helps to detox skin without stripping or leaving it dry. Organic Vanilla Beans + Vanilla Co2 add not only an amazing scent but antioxidant + anti-inflammatory properties. Mayans used to use Vanilla in their medicinal drinks and concoctions, as well as for their royalty. 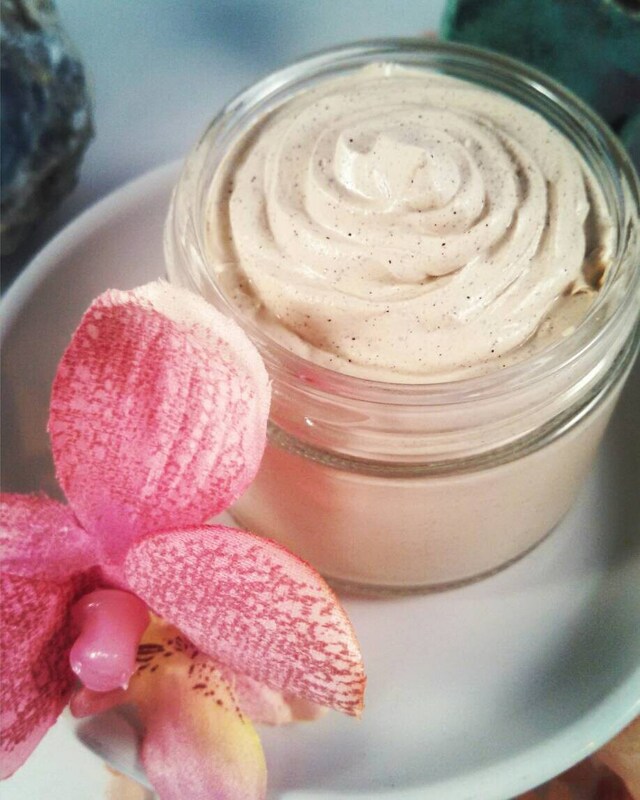 You will feel like royalty as you spread this creamy vanilla mask over your skin. Organic Glycerin + Hyaluronic Acid moisturize + sooth + hydrate parched skin. Store in the fridge for longest shelf life. I mix masks up fresh and use natural preservatives, but the very nature of masks lends them to spoilage. Apply to cleansed and damp skin, leave on 10-20 minutes, rinse with warm water. This mask does not dry down all the way.